When we arrived within half a mile of the river our Brigade was halted and ordered to stack arms and clear the road so that the Artillery could pass, then rode down to the river to see what was going on. In front of us I could see nothing but a few Cavalry skirmishers who were firing new and then at our pickets. A mile or two below, at Raccoon Ford, Genl Stewart was fighting them and using some Artillery. About 2 o’clock our Division Battalion of artillery came up and passed to the front. As soon as the enemy saw it they ran out some peices [sic] and soon a brisk duel was going on which lasted some time. Our Artillery lost six killed and eighteen wounded. 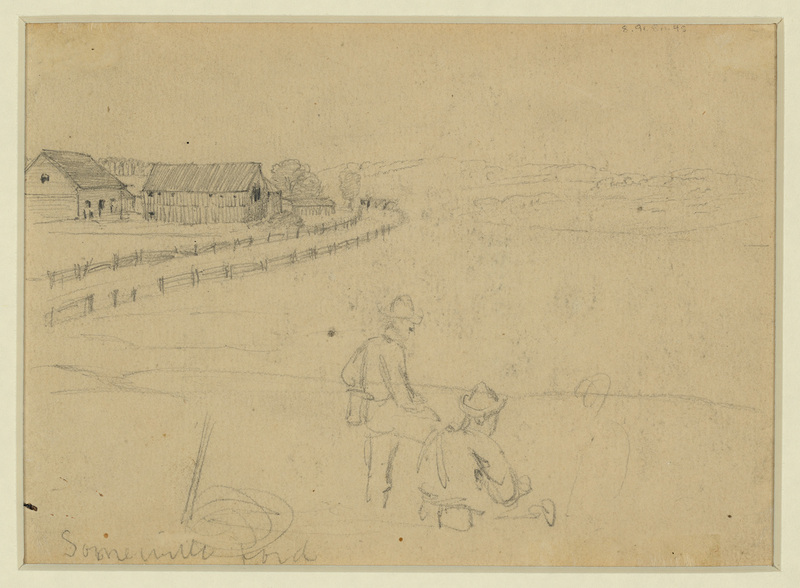 Here is another view of Union troops at Somerville Ford, in an unfinished bucolic sketch by Waud. Again, note the barns, which are also shown in the sketch above. An unfinished sketch by Alfred Waud. The road from Somerville Ford, Culpeper side. Jackson passed here on August 20, heading away from the camera. 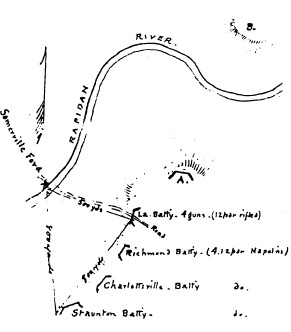 Here is a manuscript map from an intelligence report delivered to Union colonel George Sharpe in September 1863, showing the position of Confederate batteries at Somerville (the original is in RG 393 at NARA and was found by Greg Mertz in 1985). 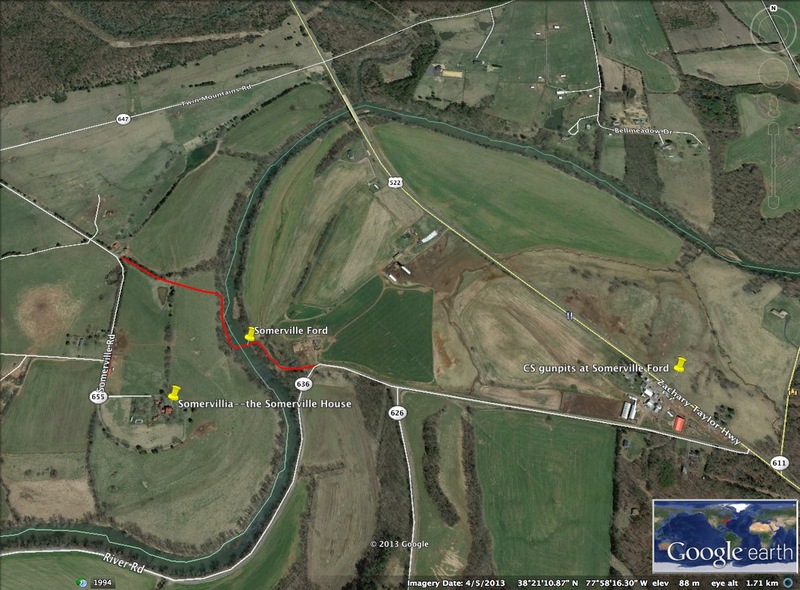 The right-most Confederate works shown on the map can still be seen in a pasture alongside Route 522. In the weeks following, the armies glared at each other up and down the Rapidan. Furlow recorded a bit of humorous competition between Union and Confederate pickets at Somerville Ford. Sept 15. Remained at the camp of the day before. Considerable fun going on, on the picket line over a turkey. The yankees shot a turkey and attempted to get it, but our sharpshooters drove them off. Our men attempted to get it then but were driven off in turn by the yankees. Thus it went on for half the day, but the yankees, I think finally got it. This made our men mad so they went over and captured the yankee skirmishers to pay for it. Somerville Ford. The missing wartime road is indicated in red. 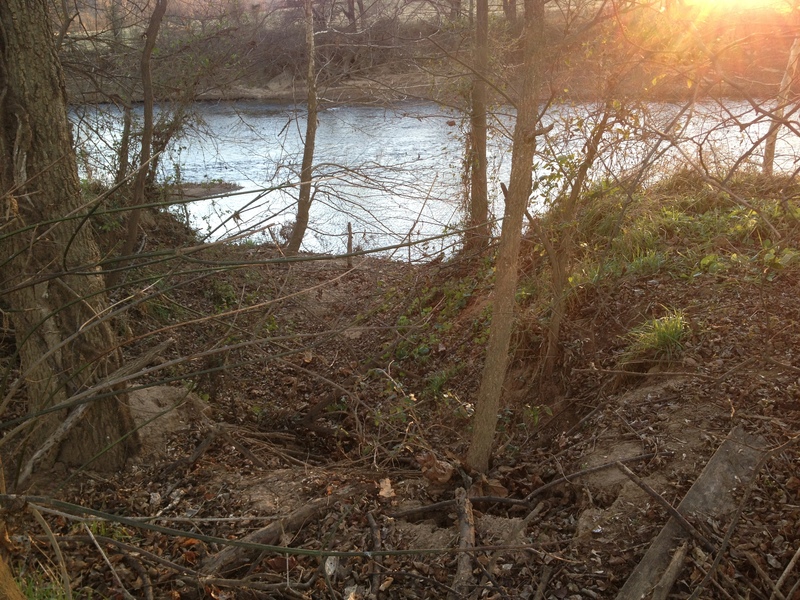 Today the ford site is largely intact, about a mile upstream from where Route 522 crosses the Rapidan. 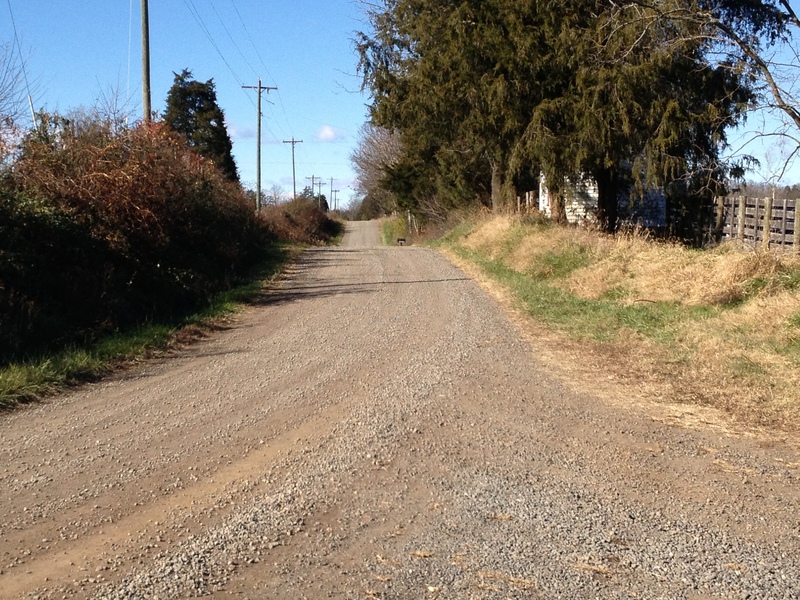 An impressive wartime road trace leads up from the ford on the Culpeper side, eventually merging into a modern farm lane that crosses “Somvervillia,” the historic Somerville farm (the wartime big house burned during the war and the present house was finished in 1870). On the Orange side, Route 636 breaks off 622 and leads directly to the ford. A highway bridge crossed the river here until the floods of 1942, and the abutments from the bridge still stand. The ford was about 200 yards downstream from the bridge. A washed-out gully may be the remnants of the wartime road leading directly into the river. The site of the bridge has become something of an ugly dumping ground. On the Orange side of the river, you can get fairly close to the site of the ford while still on the old VDOT right of way. The ford is completely inaccessible to the public on the Culpeper side. 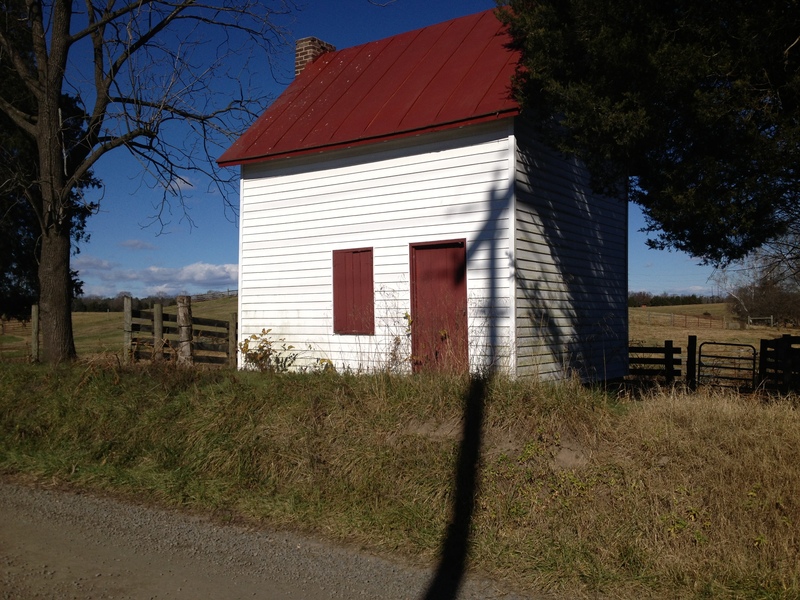 A slave cabin on the Somerville farm, alongside the road leading from the ford. Our journeys this day took us also to Morton’s Ford and several sites in between. We’ll offer up some photos of those in coming posts. Some curious stuff. For the moment, though, here’s an image of Raccoon Ford, where Longstreet’s wing of Lee’s army crossed on August 20, 1862. Theodore Fogle of the 2d Georgia, whose excellent letters are at Emory University, left this raucous description of the crossing here. An army fording a river is a sight worth seeing. Some of the men just walked in with shoes & all on, but most of them were guiltless of any clothing below the waist. I was “sanscoullotte,” sans everything except my jacket, my shirt was tucked up under it and the jacket buttoned up to my throat, in I went, wouldn’t you have been amused to see me. We all crossed safely, one fellow fell down & then current carried away everything but his shirt. Wasn’t he in a nice predicament. Raccoon Ford, from the Orange County side of the Rapidan. Longstreet and about 25,000 men crossed here on August 20, 1862. The road ran along what is today the upper edge of the island. 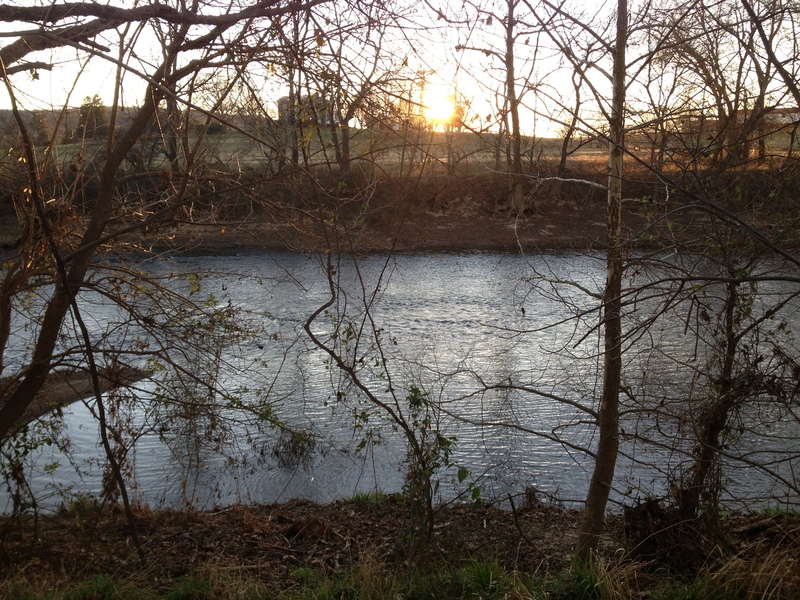 Raccoon Ford is easily seen from the Orange side of the Rapidan, along Raccoon Ford Road, Route 611. The north bank is privately owned. Thank you for the entertaining and informative read – it is good to see, in their own words, that the young men who suffered so much in this war had such wonderful moments of lightness. Their words are a treasure, especially when so keen a sense of humor peppers their accounts. Great information! Very fun to read! Battery H 1st Ohio was on picket duty at Somerville Ford. Great account and thanks for sharing. Can you let us know the source? I wonder what happened to Summerville’s “skeletons”? The Battery H account was written by John Merrell in his diary(UCLA Library). John was in the Somerville house at various times during this time period. The soldiers could see the rebel batteries across the river. At times there was sniper fire, but mostly it was quiet which allowed for trading across the river – newspapers, tobacco etc. There also exists one or two letters from William Styer (Marietta Public Library, Ohio) of the battery which also details their stay in this area at that time. I seriously hope that this spring (before the skeeters come out), I can hook up with the property owners and have a look at this location up close and personal. I am writing the biography of the man who wrote that entry; William Ellis Jones, Crenshaw’s Battery, Pegram’s Artillery, and I plan on visiting every major location upon the march he documented in his diary. Any suggestions on how I can get access/tour? contact me for access to the Raccoon Ford site. Hi James, Wow – Thanks! I am actually going to be at Spottsylvania/Fredericksburg area this weekend. Had planned to do some side trips. How’s Monday or Tuesday work for you? jones[dot]c[dot]hall[at]gmail[dot]com. Drop me a note at your convenience! Ever since i moves to Va i have become very very interested in the history of civil war. I now reside on 522 near 611 as my landlord owns the grounds of somerville ford orange side. Ive gain access to the ford and took my children to that same crossing as i watched them play in the water while telling them the stories that i learned about. Also took them to see the slave house on culpeper side. The history fascinates me and would love to see and explore the racoon ford as well. If theres any chance that this is possible i would greatly appreciate the outting. I know this post is 3 yrs old, just thought i’ld give it a try. Thank you for your time. I was wondering if you could tell us more about the map that was posted. What is Position “A”? What did the report that accompanied the map have to say? Curiously three soldiers from Battery H had transferred to the BMI and were working for Sharpe. Wonder if they had a hand in this report. I attach here a pdf of the entire report, as transcribed by Greg Mertz many years ago. As you will see, Sharpe credits much of his information to Confederate deserters. Apologies for the poor quality of the photocopy. Can you repost the Mertz report? or did I just miss it somewhere on here? thanks in advance. 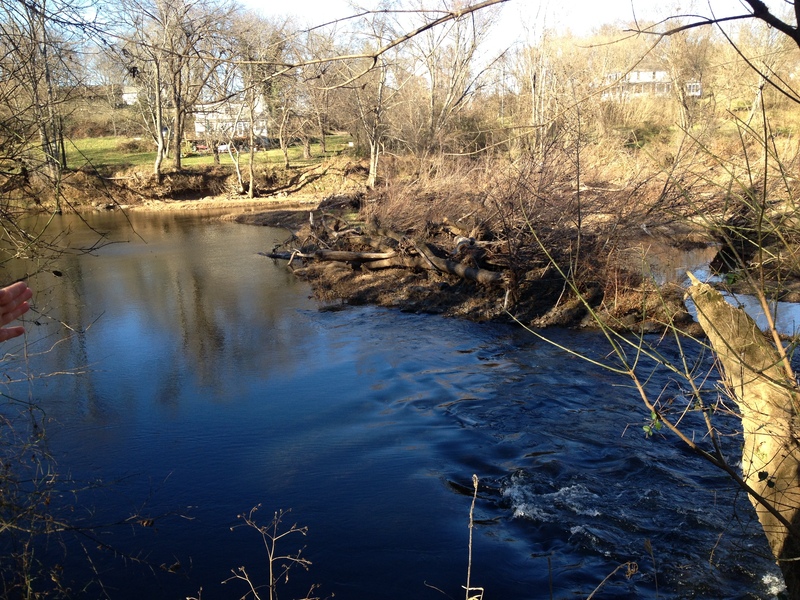 There is very visible Ford approximately 3/4 mile upstream from Raccoon Ford, the village. It branches off to the left of the stringfellow cemetery. 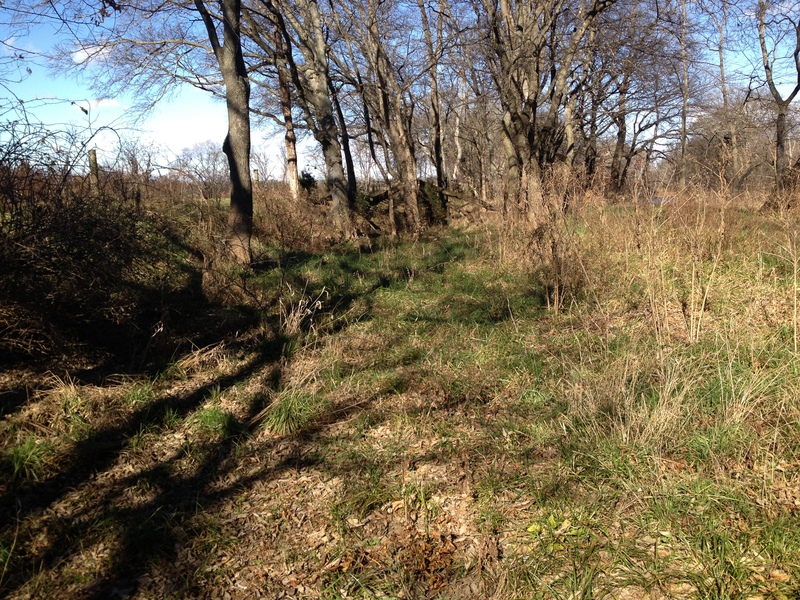 Just to to East of Retreat..
I’m trying to determine if this is the site of a Revolutionary War Grave – ROSSON, Reuben. 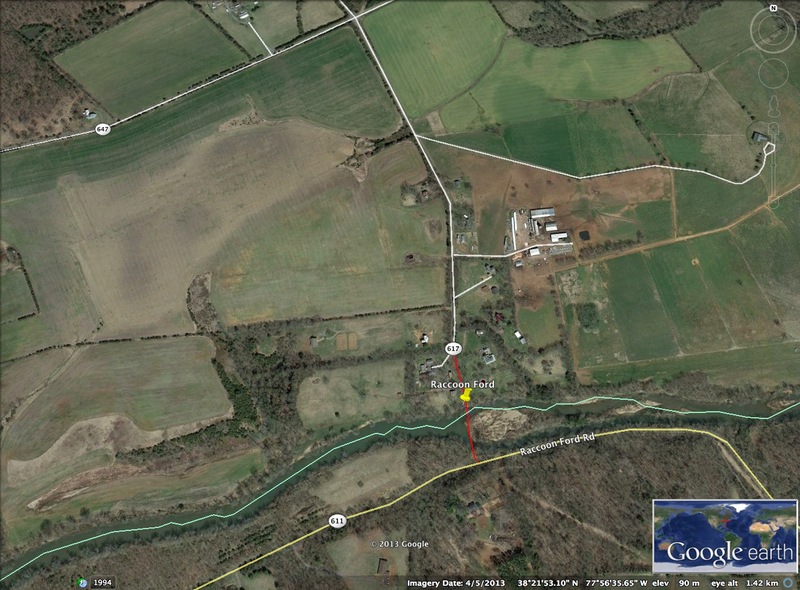 The VA Sons of the American Revolution mention a farm “behind Culpeper and Racoon Ford” as the burial location. Still trying to find more details. Any mention by the owner about this? In the aerial/satellite photo of Raccoon Ford adjacent to the Route 647 symbol in the upper left hand corner of the photo stands St. Paul’s Episcopal Church. Built in 1850 and occupied numerous times by both Union and Confederate forces during the war. It last served as winter quarters for Custer’s Union Michigan Calvary during the Winter of 1863-64. Custer’s troopers badly damaged the church by knocking a hole in the back wall so they could bring their horses in with them at night, This was done out of concern that the Ewells soldiers just 700 yards away, would sneak across the Rapidan River and steal them. The church was also referred to as the “Lime Church” by locals, as it was constructed of a wood frame and filled with concrete which was a highly unusual method of erecting a building for the time period. The Union solders burned the church pews for firewood to keep warm, and the church records were lost probably used as either toilet paper or for fire starting material. When the union cavalry departed that following spring, they added further insult by busting out all the windows and tore the doors off their frames etc. Out of 2 dozen churches in Culpeper County at the outbreak of the war, St. Paul’s is one of only four to survive due primarily to the concrete used in it’s construction. A preservation effort is now underway to save it from further vandalism and return it to it’s rightful place in Civil War history. St Paul’s Episcopal Raccoon Ford served as the Field Ed placement site for the (future) Bishop John Shelby Spong. He would drive from Alexandria at 5AM to be there. Would love to know more about the preservation project.